One Perfect Little Miracle: Thinking Of Spring. 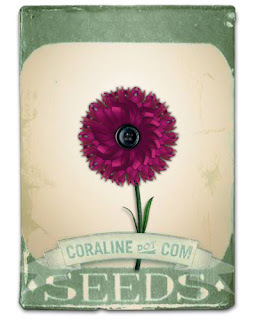 My sister, Gayle posted her little friend Mia's flower she made at the Coraline movie website. I think it is absolutely lovely. Of course, I wanted to play too! Well, those are just too cute. Off I go to try my hand at this. The entire website is soooooooo fun. Mia and I had our names spelled out by mice. We buttoned our eyes... and Hugo's. We watched the video featuring the woman who knits the teeny tiny sweaters that Coraline wears. She uses needles that are the size of a human hair. Amazing stuff.